On Thursday 23 June, the flagship returned to Southampton, Remastered. Over the course of her refit, the interior and exterior of the flagship has been transformed. If anything sums up the freedom of your voyage, it is the array of places to eat – from healthy to hearty, from light bites to haute cuisine. Just let your mood decide. 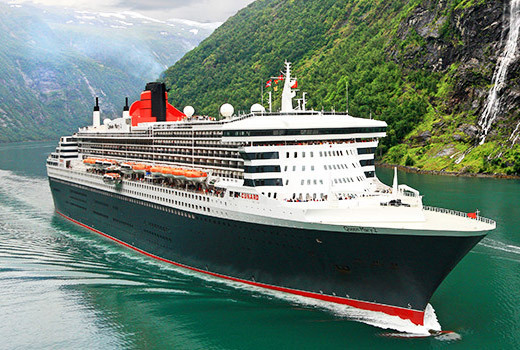 Queen Mary 2, affectionately known as QM2, was famous even before her first sailing and a worthy heir to Cunard’s rich legacy. As the flagship of the world’s most respected fleet of luxury ocean liners, you’ll delight in her accommodation and renowned restaurants, her breathtaking Grand Lobby and the amazing array of unsurpassed amenities she offers. You’ll notice it the moment you walk through her doors into her soaring Grand Lobby, and be awed from the first instance you experience the famous Cunard White Star ServiceSM. This sophisticated monarch also boasts the most modern luxuries and amenities – from the pampering services of the only Canyon Ranch SpaClub® on the seas to the fascinating Cultural Enrichment Program led by prestigious experts. This regal royal must truly be seen to be believed – come live the adventure.